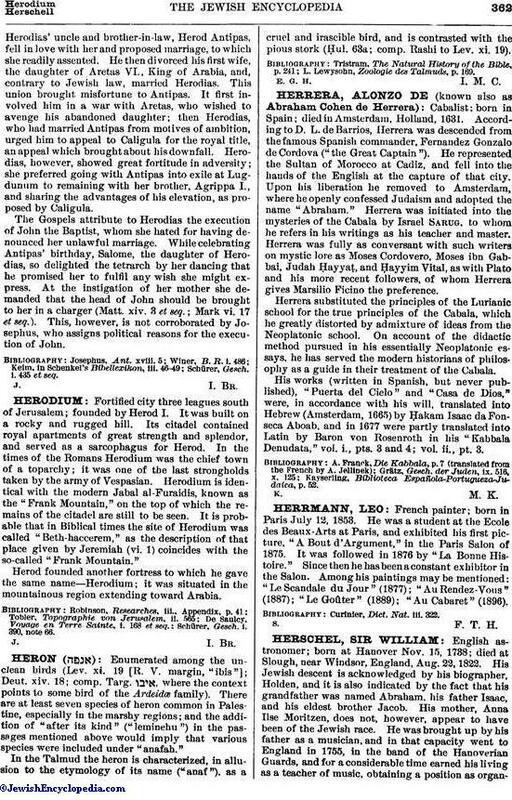 Cabalist; born in Spain; died in Amsterdam, Holland, 1631. According to D. L. de Barrios, Herrera was descended from the famous Spanish commander, Fernandez Gonzalo de Cordova ("the Great Captain"). He represented the Sultan of Morocco at Cadiz, and fell into the hands of the English at the capture of that city. Upon his liberation he removed to Amsterdam, where he openly confessed Judaism and adopted the name "Abraham." Herrera was initiated into the mysteries of the Cabala by Israel Sarug, to whom he refers in his writings as his teacher and master. Herrera was fully as conversant with such writers on mystic lore as Moses Cordovero, Moses ibn Gabbai, Judah Ḥayyaṭ, and Ḥayyim Vital, as with Plato and his more recent followers, of whom Herrera gives Marsilio Ficino the preference. Herrera substituted the principles of the Lurianic school for the true principles of the Cabala, which he greatly distorted by admixture of ideas from the Neoplatonic school. On account of the didactic method pursued in his essentially Neoplatonic essays, he has served the modern historians of philosophy as a guide in their treatment of the Cabala. His works (written in Spanish, but never published), "Puerta del Cielo" and "Casa de Dios," were, in accordance with his will, translated into Hebrew (Amsterdam, 1665) by Ḥakam Isaac da Fonseca Aboab, and in 1677 were partly translated into Latin by Baron von Rosenroth in his "Kabbala Denudata," vol. i., pts. 3 and 4; vol. ii., pt. 3. Kayserling, Biblioteca Española-Portugueza-Judaica, p. 52.